Mooretown Precision Engineering Ltd have been leading the way in fabrication, hydraulics and truck bodybuilding from their base in Co Meath for the best part of two decades now. Irish Trucker heard more from Managing Director Noel Carey recently. These are busy times for Mooretown Precision Engineering Ltd and company founders Noel and Helena Carey simply wouldn’t have it any other way. Based in Ratoath, Co Meath – just 20 minutes from Dublin city centre – the company was established in 1999 after Noel had spent 20 years working in the fabricating and access equipment industry. The Royal County native had gained the knowledge and experience necessary to go out on his own and once his better half Helena was willing to join him, Noel was ‘all-in’. Today, Mooretown Precision Engineering Ltd employs 12 staff at its 10,000 square foot premises just outside the town of Ratoath, including two more members of the Carey clan, as Noel himself explained. “We’re in Mooretown, Ratoath, Co Meath and the business is going 19 years,” he outlined. Since its inception, Mooretown Precision Engineering Ltd has earned great business relationships with various major companies such as Eir, ESB Networks, Dublin City Council, Aer Lingus and Mitsubishi Motors. They have two service engineers employed at the Mooretown premises which are mainly based on the road, servicing vehicles and trailers all over Ireland. The company’s staff is highly trained, experienced in the industry and take great pride in the work they do all year round. The deep origins of the business date back to a time when Noel worked for a firm in Athboy by the name of Turmec. “I used to be their production manager,” he explained. “They used to build platforms so eventually I went at it on my own and started my apprenticeship as a machinist. “Myself and my wife started this company very young and thankfully we haven’t had to look back since. “We’d have started off doing access platforms and then eventually got involved with Versalift in the UK. 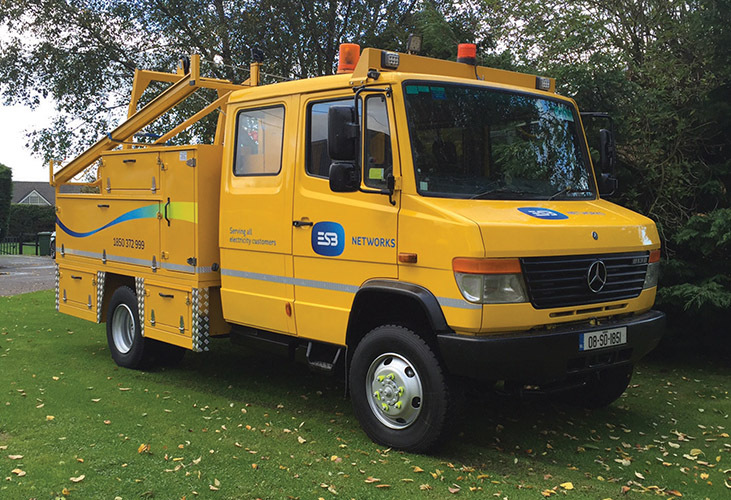 Their biggest customer at the time was Eircom and we maintain all of their vehicles and we now do the same for ESB. From Day One, Noel and Helena have always believed in building strong business relationships and have continuously strived to meet their customers’ requirements and schedules on all projects. At Mooretown Precision Engineering Ltd, they believe attention to detail is paramount and it’s evident on all jobs completed. Noel is happy to report that the business continues to grow and hopes to take on new challenges and continue attracting new customers in the future through the detailed workmanship, creative outlook and customer service that his company provides. “Business is very good,” he beamed. “I have an on-going contract with ESB and I’ve two men on the road full-time with over half the staff doing a back-up service. So what is it that has Mooretown Precision Engineering Ltd’s clients continuously choosing them first ahead of other competitors? Noel feels it comes down to a couple of qualities which has helped the company to become a “one-stop shop” for its customers. “I’m hands on and I can tell them what they need,” he put it simply. “Within a week you’ll have a product and we do everything here – we’re very much a one-stop shop. Servicing nationwide is something that Noel and his family are proud to provide for their customers and, according to the man himself, the plan is to keep things the way they are at the moment without expansion. Should the next generation of Careys decide they want to grow the business further, Noel says he’ll go along with the move but, for now, he’s quite content with where Mooretown Precision Engineering Ltd currently is. “Bar the young fella takes us a step further, we’re happy with where we are right now. We’re compact and bigger isn’t necessarily better,” concluded the Managing Director. Last year Noel’s son Cian – a champion sports racer – became Meath’s BSafe Sports Ambassador. He also scooped the Motorsport Ireland Young Racing Driver of the Year title in December 2016, racing in Formula Three in the UK. The 23-year-old Ratoath man backed that up this past September by winning the internationally-acclaimed Leinster trophy. His role as BSafe Sports Ambassador sees him visiting schools throughout the year to talk about the organisation’s to keep roads safe. It’s fair to say that the future of Mooretown Precision Engineering Ltd is in very safe hands.